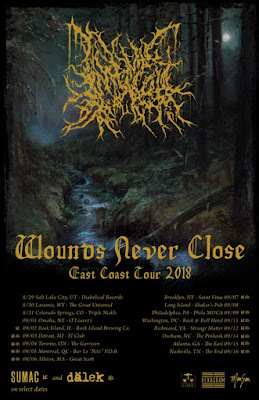 Idaho-based extreme metal act INFERNAL COIL begins their Wounds Never Close tour, as their debut LP "Within A World Forgotten," nears September release through Profound Lore Records. 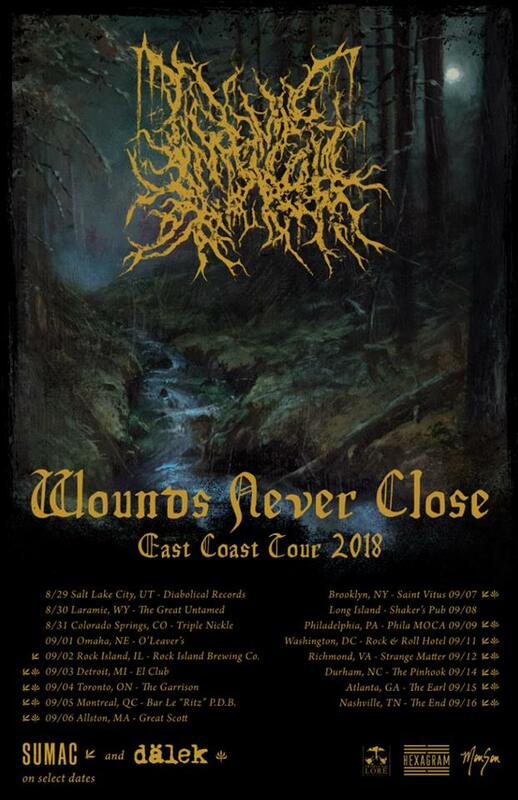 Leading with several shows on their own this week, INFERNAL COIL will then meet up with Sumac and Dälek for two weeks of touring across the East Coast. Brutal, unrelenting, transcendental ashen death metal, INFERNAL COIL's "Within A World Forgotten" is an artistic expression mired in vast dark atmosphere through the many layers of sound, ambience, and noise that cast an enveloping shadow throughout the thirty-six minutes that encompass this overbearing work. The album was produced by Billy Anderson (Bell Witch, Leviathan, Red House Painters, Amenra) and features artwork by Adam Burke. Stream INFERNAL COIL's "Continuum Cruciatus" and "Crusher Of The Seed" at infernalcoil.bandcamp.com. Profound Lore will issue Within A World Forgotten on CD, LP, and digital formats on September 14th. Find CD and digital preorders at infernalcoil.bandcamp.com, find North American CD and LP preorders at profoundlorerecords.merchtable.com, European CD and LP preorders at profoundlore.aisamerch.de, and iTunes preorders itunes.apple.com. INFERNAL COIL's 2014 demo Burning Prayer of Infinite Hatred gave listeners a glimpse into the fury and dissonance the band delves into through a barrage of blast beats, roaring guitars and guttural vocals. And as witnessed with their follow-up EP, Bodies Set In Ashen Death, it saw the band explore more complex, enchanting boundaries that would serve as a harbinger to what would eventually culminate to horrifying intensity into what would become Within A World Forgotten. The musical dichotomy speaks to INFERNAL COIL's conceptual themes of the natural world's paradoxes, contrasting the beauty and chaos of nature, as well as humankind's seemingly inevitable self-destruction.